The following information is taken from "The Prologue of Ochrid". The dates given are when that event is commemorated in the Orthodox Church. 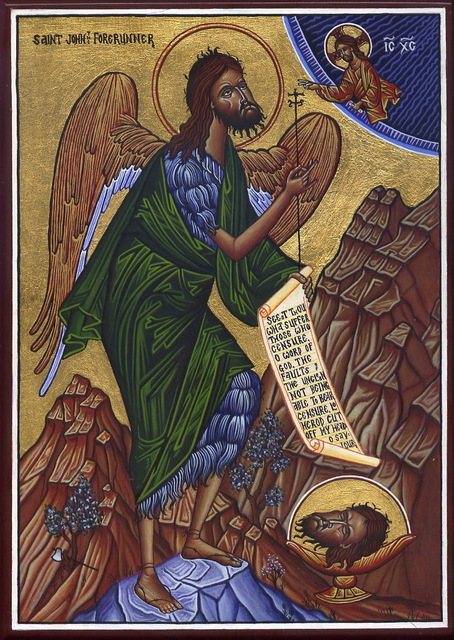 There is a reading of this Icon of St. John the Baptist at the very end of this page. The reading is taken from "A Reader's Guide To Orthodox Icons". Because John's main role in his life was played out on the day of the Epiphany (Theophany-January 6th), the Church from earliest times dedicated the day following Epiphany to his memory. To this feast is also linked the incident with the hand of the Forerunner. The Evangelist Luke desired to remove the body of John from Sebaste, where the great prophet was beheaded by Herod, to Antioch his place of birth. He succeeded though, in acquiring and translating only one hand which was preserved in Antioch until the tenth century after which it was transferred to Constantinople from where it disappeared during the time of the Turks. Feasts of St. John are celebrated several times throughout the year. Among the Gospel personalities who surround the Savior, John the Baptist occupies a totally unique place by the manner of his entry into the world as well as by the manner of his life in this world, by his role in baptizing people for repentance and for his baptizing the Messiah and, finally, by his tragic departure from this life. He was of such moral purity that, in truth, he could be called an angel [messenger] as Holy Scripture calls him rather than a mortal man. St. John differs from all other prophets especially in that he had that privilege of being able, with his hand, to show the world Him about Whom he prophesied. It is said that every year on the feast of the saint, the bishop brought the hand of St. John before the people. Sometimes the hand appeared open and other times the hand appeared clenched. In the first case it signified a fruitful and bountiful year and, in the second case, it meant a year of unfruitfulness and famine. On this day the mercy, miracles and wisdom of God are celebrated: His mercy toward the devout and righteous parents of St. John, the aged Zacharias and Elizabeth, who all their lives had wished for and begged a child from God; His miracle, that of John's conception in the aged womb of Elizabeth; His wisdom, in the dispensation of man's salvation. God had an especially great intention for John: namely, that he be the Prophet and Forerunner of Christ the Lord, the Savior of the world. Through His angels, God announced the births of Isaac to the childless Sarah, Samson to the childless wife of Manoah, and John the Forerunner to the childless Zacharias and Elizabeth. All of these were those for whom He had special intentions, and he foretold their birth through his angels. How could children be born of aged parents? If someone desires to understand this, he should not ask men about it, for men do not know; nor should he study natural law, for this is beyond natural law. Rather, he should turn his gaze upon the power of the Almighty God, Who created the whole world from nothing, and Who needed no parents-old or young-for the creation of the first man, Adam. Instead of being curious, let us give thanks to God, Who often reveals His power, mercy and wisdom to us in ways that are beyond natural law-in which we would be imprisoned without these special miracles of God, and would fall into despair and forgetfulness of God. Six months before his appearance in Nazareth to the All-holy Virgin Mary, the great archangel of God, Gabriel appeared to Zacharias the high priest in the Temple at Jerusalem. Before he announced the miraculous conception to the unwed virgin (Mary), the archangel announced the miraculous conception to the childless old woman (Elizabeth). Zacharias did not immediately believe the words of the herald of God and this is why his tongue was tied with dumbness and remained as such until eight days after the birth of John. On that day, the relatives of Zacharias and Elizabeth gathered for the young child's circumcision and for the sake of giving him a name. When they asked the father what name he wishes to give to his son and being dumb, he wrote on a tablet: "John." At that moment his tongue became loosed and he began to speak. The home of Zacharias was on the heights between Bethlehem and Hebron. The news of the appearance of the angel of God to Zacharias was spread throughout all of Israel, as well as of his dumbness and the loosening of his tongue at the moment when he wrote the name "John." The news concerning this even reached Herod. Therefore, when Herod sent soldiers to slay the children throughout Bethlehem, he directed men to the hilly dwelling place of the family of Zacharias to kill John also. However, Elizabeth promptly hid the child. Enraged, at this King Herod sent his executioners to Zacharias in the Temple to slay him (for it happened that it was Zacharias' turn again to serve in the Temple of Jerusalem). Zacharias was slain between the court and the temple and his blood coagulated and petrified on the stone pavers and remained a perpetual witness against Herod. Elizabeth hid with the child in a cave where she died soon after. The young child John remained in the wilderness alone under the care of God and God's angels. Herod Antipas, son of the elder Herod, who was the slayer of the children of Bethlehem at the time of the birth of the Lord Jesus, was ruler of Galilee at the time when John the Baptist was preaching. This Herod was married to the daughter of Aretas, an Arabian prince. But Herod, an evil sprout of an evil root, put away his lawful wife and unlawfully took unto himself Herodias as his concubine, the wife of his brother Philip, who was still living. John the Baptist stood up against this lawlessness and strongly denounced Herod who then cast John into prison. At the time of a banquet in his court in Sebastia in Galilee Salome, the daughter of Herodias and Philip, danced before the guests. The drunken Herod was so taken by this dance that he promised Salome that he would give her whatever she asked of him, even though it be half of his kingdom. Being persuaded by her mother, Salome asked for the head of John the Baptist. Herod gave the order and John was beheaded in prison and his head brought to him on a platter. John's disciples took the body of their teacher by night and honorably buried it and Herodias pierced the tongue of John with a needle in many places and buried the head in an unclean place. What later happened to John the Baptist's head can be read on February 24. However, God's punishment quickly befell this group of evil doers. Prince Aretas, in order to cleanse his daughter's honor, attacked Herod with his army and defeated him. The defeated Herod was sentenced by the Roman Caesar, Caligula, to exile at first to Gaul and later to Spain. As exiles, Herod and Herodias lived in poverty and humiliation until the earth opened up and swallowed them. Salome died an evil death on the Sikaris (Sula) river. The death of St. John occurred before the Pascha (Passover) but its celebration on August 29 was established because, on that day, a church which had been built over his grave in Sebastia by Emperor Constantine and Empress Helena was consecrated. In this church the relics of John's disciples, Eliseus and Audius, were also placed. NOTE ON WHAT HAPPENED TO SOLOME - If you observe how men die, you would see that the death of a man usually resembles his sin. As it is written: "For all they that take the sword shall perish with the sword" (St. Matthew 26:52). Every sin is a knife and men usually are slain by that sin which they most readily committed. An example of this is given to us by Salome, the foul daughter of Herodias who asked for and received from Herod the head of John the Baptist on a platter. Living in Spain in the town of Lerida (Loredo) with the exiled Herod and Herodias, Salome set out one day across the frozen river Sikaris. The ice broke and she fell into the water up to her neck. Icebergs squeezed around her neck and she wiggled, dancing with her feet in the water as she once danced at the court of Herod. However, she was unable either to raise herself up or to drown until a sharp piece of ice severed her head. The water carried her body away and her head was brought to Herodias on a platter as was the head of John the Baptist at one time. Behold how terrible a death resembles the sin committed. The great and glorious Baptist John was beheaded according to the wish and instigation of the wicked Herodias, the wife of Herod. When John was beheaded, Herodias ordered that his head not be buried with his body for she feared that this awesome prophet, somehow, would resurrect. Therefore, she took his head and buried it deep in the ground in a secluded and dishonorable place. Her maidservant was Johanna, the wife of Chuza a courtier of Herod. The good and devout Johanna could not tolerate that the head of the Man of God remain in this dishonorable place. Secretly she unearthed it, removed it to Jerusalem and buried it on the Mount of Olives. Not knowing of this, King Herod, when he learned of Jesus and how He worked great miracles, became frightened and said: "This is John whom I beheaded; he has been raised from the dead" (St. Mark 16:16). After a considerable period of time, an eminent landowner believed in Christ, left his position and the vanity of the world and became a monk, taking the name, Innocent. As a monk, he took up abode on the Mount of Olives exactly in the place where the head of the Baptist was buried. Wanting to build himself a cell for himself, he dug deep and discovered an earthen vessel and in it a head, which was mysteriously revealed to him, to be the head of the Baptizer. He reverenced it and reburied it in the same spot. Later, according to God's Providence, this miracle-working relic (The head of St. John) traveled from place to place, sunk into the darkness of forgetfulness and again was rediscovered. Finally, during the reign of the pious Empress Theodora, the mother of Michael and the wife of Theophilus and at the time of Patriarch Ignatius it was translated to Constantinople. Many miraculous healings occurred from the relic of the Forerunner (Precursor). It is important and interesting to note that while he was still alive, "John did no miracles" (St. John 10:41), however, his relics have been endowed with miraculous power. August 29 is the day which commemorates the Beheading of the Holy Glorious Prophet, Forerunner, and Baptist John. We know John as a prophet – the greatest and last prophet of the “Old Testament”, who specifically announced the coming of the Messiah, Who was Jesus. We also know how he preached in the wilderness, baptized Jesus Christ, and finally was beheaded on the orders of Herod for censuring the King. The Icon shown below encompasses all of this teaching and tradition in one image. It is an English or North American Icon painted in a style that arose in the 15th and 16th centuries in Greek-speaking countries. It is also found in some Balkan countries too (Bulgarian, Serbian, Macedonian), though this is probably due to the influence of the old Byzantine Empire upon these areas. What sets this icon apart, and is probably the most striking part of the Icon, is the wings given to the figure of John the Baptist. The presence of the wings is to symbolize nothing more or less than John’s status as a divine messenger (in Greek “Evangelos”, from where the word “Angel” is derived). Aesthetic Saints are often described as living the radically non-worldly “angelic life”, and so the wings are recognizing John as the archetype of this desert living. therefore every tree which does not bear good fruit is cut down and thrown into the fire. Seest Thou what suffer those who censure, O Word of God, the faults of the unclean. Not being able to bear censure, Lo Herod cut off my head, O Saviour. Over St. John’s camel-skin clothing is invariably a green robe, which symbolizes “earthliness”, and in this case it is because John grew up outside, in the wilderness. Later saints who also took up the Christian struggle in the wilderness can also be depicted in green for the same reason, and are sometimes known as “Green Martyrs”. That is to say they are martyrs (literally meaning witness) to the Faith, not by the shedding of blood, but by their ascetic struggle. Of course, St John is a both a green martyr and a martyr who shed his blood, hence the presence of the green robe and the cross. descended there to preach the Gospel of Repentance and coming of the Messiah to the imprisoned souls. Therefore Icons of this dispensation of God exist too in order to instruct and inspire the faithful to reverence of John. As the hymns sung on August the 29th proclaim: The glorious beheading of the Forerunner, became an act of divine dispensation, for he preached to those in hell the coming of the Savior. Let Herodias lament, for she entreated lawless murder, loving not the law of God, nor eternal life, but that which is false and temporal.